The new Diamond Series Roof Hatch is designed for safe and easy roof access while using R-6 insulation values to reduce building energy costs. New Diamond Grip makes securing roofing membrane quick and easy. Construction: 11 Mill Finish Aluminum with 12" high curb and 3-5/8" wide flange for securing to roof deck. All corners are fully welded and mitered. Hinge is a heavy duty box-type. Item weight is about 68 lbs. Springs: Now counterbalanced to comply with OSHA 1023 fall protection regulations for single-hand operation of latches from a ladder. Compression springs are contained in zinc-plated steel cylinders. Grip Counterflashing: Features an embossed counterflashing design at the curb top – Diamond Grip™ – enables you to quickly secure roof membrane and backing rod without tools or sharp edges. Curb: 11 gauge mill finish aluminum single wall curb and counterflashing with Diamond Grip (secures roofing membrane with self locking feature). Cover: Formed and welded with liner, tested to support a live load of 40psf. 11 gauge mill finish aluminmum with 18 gauge liner. Gasket: Continuous, weatherproof EPDM sponge rubber seal, adhesive-backed. Insulation: R-6. The curb includes a 1" polyisocyanurate insulation surrounding the base and between the exterior cover and liner. Finish: All surfaces are mill finish (paintable if needed). Clear Opening: 25 x 24". Sizes: Standard in 30x54, 30x96, 32x72, 36x30, 36x36, 37x30, 48x48 inch openings. Leadtime may apply to some sizes. 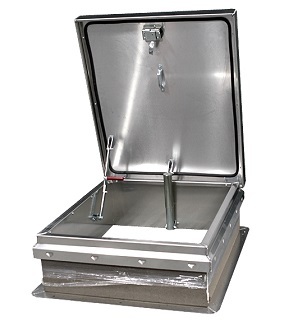 Roof Access Hatch, 36 X 30 inch Opening, All Aluminum with Mill Finish Self Flashing Base. Hinge is on the 30 Side. Made in USA by Babcock-Davis. Price/Each. Roof Hatch Stainless Steel Hardware Optional Kit, for JL Industries Roof Hatch. Applies hatches up to 48x48 size. Includes long outer hinge, latch/lock, hasp (all installed on a new hatch order). Price/Kit.